How does a lockdown drill work and what are the procedures? We live in an unfortunate time where shootings are all too common, and whether you blame society or the individual, increasing building security can be crucial in helping prevent tragedies. Obviously having locks and keys at all access points is the first step, but with modern access control, you can enable features like lockdowns, which can help provide that extra piece of mindat the critical moment. In this article, we’ll cover what a lockdown procedure is, why you want to set one up, and what the procedures are for lockdown. What is a lockdown, and why is it important? As the name suggests, a lockdown is a situation where every door, window, or other access point in your office gets locked down, meaning that all entry and exit attempts are blocked. In “old” times (in other words, before the Internet of Things industry took off), these lockdowns would be accomplished by simply barring the doors, turning off the lights, and hiding. These days, we have modern solutions, and the process of locking down a building has never been faster or more intuitive. We’ll cover the details of that in the next section. Why are lockdown drills important? Good physical security is essential and can save your life, or at the very least all of your data and possessions. Even in what seem like safe areas, accidents or disgruntled employees/customers/passerby can cause a lot of damage. Even the paragons of modern offices, like the Googleplex in Mountain View, can be victims of one person who decides to exact some sort of misguided revenge. While it’s true that violent crimes have actually decreased in recent years, and public perception doesn’t always align with reality, the fact that violent crime remains a problem is unavoidable. Having an established lockdown protocol in your space, and practicing lockdown drills can save lives. Where should lockdowns be implemented? If your first instinct was to answer this question with “everywhere,” then you think the same way we do at Kisi. However, there are some more obvious use cases for this lockdown functionality. The first case we’ll go over here is schools. It seems quite obvious: Schools are incredibly vulnerable these days, with over 80 school shootings happening in 2018 alone, to add to the more famous tragedies of recent years like Columbine and Sandy Hook. Regardless of who is at fault, the fact that we want to protect the lives of young students is evident, and every measure should be taken to prevent more events like these. And lockdowns are a perfect fit. While older students can be counted on to make somewhat more rational decisions, it’s trickier with elementary and middle school students, and often the best way to protect them is to keep them with teachers in a safe environment. This means that beyond locking the doors to block the active shooter, you also want to lock them so that students don’t unintentionally run straight into the shooter (or assailant) in a mad rush to escape.. While lockdown procedures are certainly not addressing the systematic underlying issue that causes school shootings, they can certainly help reduce the damage when they do occur. Beyond schools, it’s also likely that an office in a particularly dangerous or crime-prone area would want lockdown procedures in effect. Lockdowns in an office would entail locking all doors that have the feature equipped, and not allowing any ingress or egress. With most modern offices in larger multi-office buildings, it’s likely that you will get a warning before the shooting reaches your office: Statistics would suggest that another office will be targeted first, so you will be able to prepare. With those precious minutes in which you can prepare your office, a lockdown protocol is key. First, you’ll want to ensure that the active shooter can’t enter your office — lock it! You’ll also want to make sure that your employees don’t run randomly around the hallways, accidentally entering an area of crossfire — keep them in the office where it’s safe! And best of all, with modern systems, as we’ll see in a minute, the process of locking down is extremely quick and can be done from any computer. How does a lockdown work? 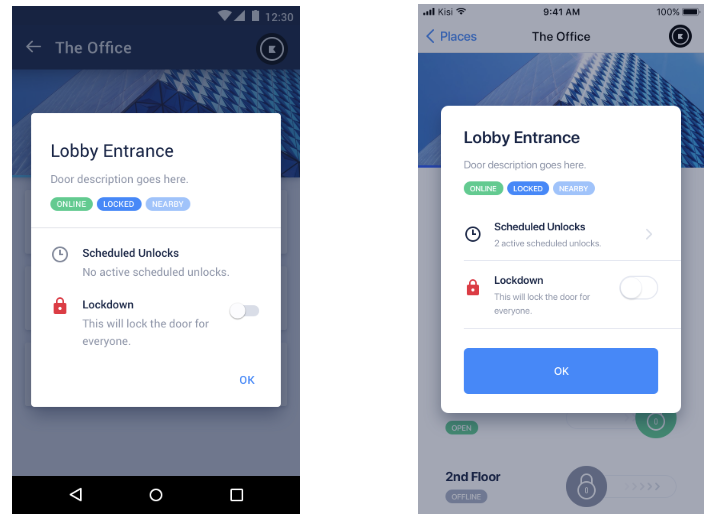 Now that we’ve covered why lockdowns are important, and what are the more obvious use cases for it, we’ll go into the tech behind lockdowns, focusing on modern smart access control. At Kisi, for physically securing your space, we recommend going with the most future-proof solution — fully mobile and web based access control. The way these systems work is relatively simple: You have door readers at your doors connected to your electric locks, and a controller that acts as the link between the readers and the provider’s servers. This reader will transmit data back to the access control provider, and in return, you’ll get all sorts of interesting analyses on your access usage. 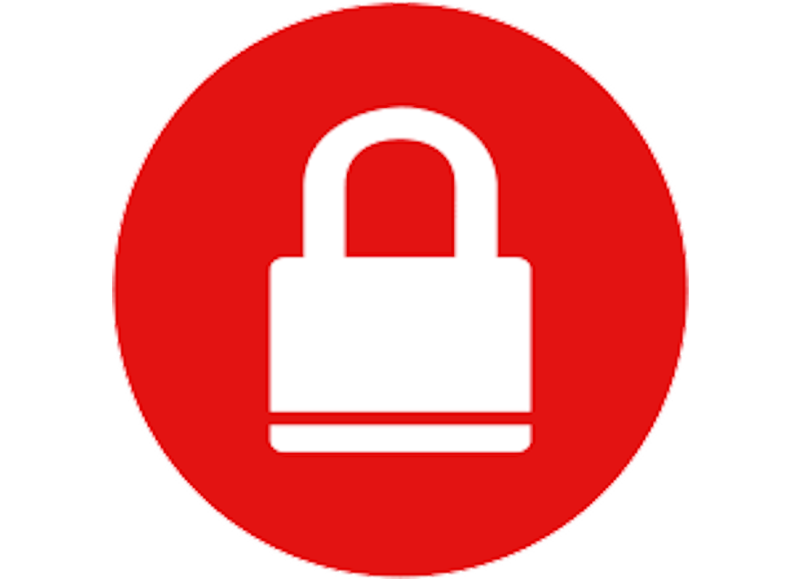 These modern systems provide much more functionality than traditional legacy lock-and-key systems, and one of the features you’ll find is lockdown functionality. Given that the entire interface can be controlled from the web or mobile app, you can very easily navigate to your location, and as a system administrator, initiate a lockdown, whether it’s a drill or a real-life situation. The lockdown functionality can be seen at the bottom of the screenshot there. It is marked as an override, because naturally it would override any other sort of scheduled activities you’d have, be they scheduled unlocks, or access granting or anything of the sort. You might not always have access to a laptop in an emergency though, and we understand that—that’s why the lockdown functionality is available through the iOS and Android apps as well. With modern access control, it’s easier than ever to secure your space, even in the case of emergencies. Having the tech enabled is only half the battle, though—just as important is establishing routines and systems in place so that everyone in the office knows what to do in case of an emergency. The lockdown will stop anybody from leaving or entering, but there are policies over and above that that need to be defined. More than simply informing employees about the feature and drilling them with it, you will need to ask yourself a couple of questions as an administrator. A lockdown is only as effective as the person who initiates it—if you want your office or school to be properly secured in the case of an emergency, you’ll want strict policies on who can initiate a lockdown override of your access control. Your first thought might be to only allow the system administrator access to this functionality. However, this might be the wrong move — what if the sysadmin was hurt or otherwise incapacitated during the emergency? At the very least, you want one backup. However, if like us you believe in being “better safe than sorry,” then you’ll agree that it’s better for anyone to be able to initiate a lockdown, and then you can reassess once any potential threat has been located and, if applicable, stopped. Does law enforcement need to be involved? There are varying opinions here, and depending on your use case, you might want different things. If the environment is a school, and only administrators and teachers have the ability to initiate a lockdown, then you probably want law enforcement contacted immediately and automatically. You probably trust your teachers not to falsely “pull the alarm,” and school shootings ought to be stopped immediately. 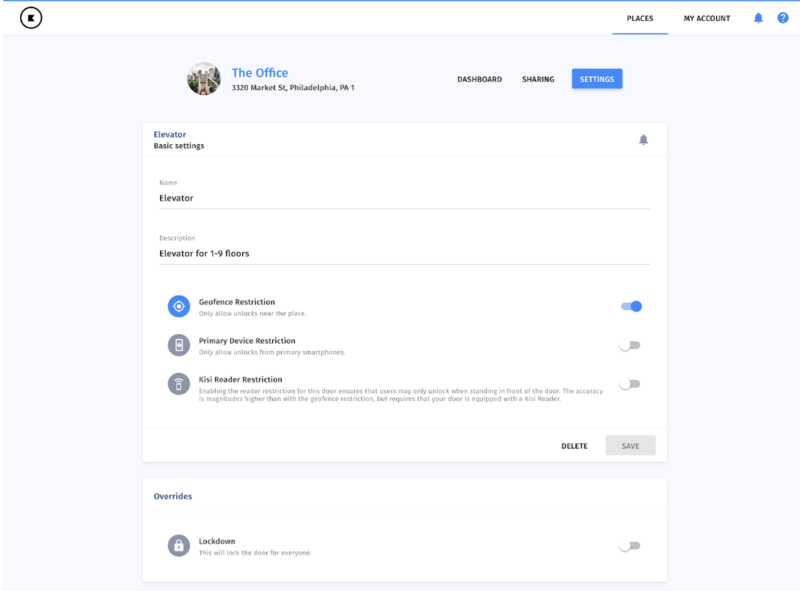 However, if it’s a bigger office, and any employee has the ability to initiate a lockdown, then it’s more likely that you’ll want to contact law enforcement separately and not have them contacted automatically. As the number of employees increases, so does the probability of a false alarm, and having law enforcement contacted by mistake on a regular basis is not a good look for your company, or for the city itself. Calling the police for false alarms wastes taxpayer money and draws officers away from where they’re really needed. Also, with so many people with smartphones around, it’s likely that police were contacted anyway! What if there is a false-alarm lockdown? In the first section here we discussed who should be allowed to initiate a lockdown, and we proposed leaving the option open to any employee. However, this does require a certain amount of trust in your employees. You’ll have to be sure to tell them what the functionality does, and when to activate it and when not to. You’ll also have to trust that they won’t play pranks on the office. A false alarm, while not dangerous, can be costly in terms of productivity, and if law enforcement is contacted, can be damaging to your reputation and can discredit you (ever heard of the boy who cried wolf?) However, false-alarm lockdowns, if they’re truly an accident or unintentional, should be forgiven because employees shouldn’t feel scared to activate the functionality when they truly believe they should. Closing Thoughts — Are lockdowns really the solution or are there alternatives? Lockdowns are definitely a step in the right direction for securing your space. They can help in the case of an emergency, and will ensure that as an administrator you can control your physical environment as well as your digital one. While they certainly don’t address the underlying issues that cause people to be violent and act out, they will help in the short term while we as a society work out those other problems. And with modern access control, initiating a lockdown has never been simpler — you can just do it from your smartphone or laptop.